Today Jyoti from The Veggie Hut is with us. She is an Engineering graduate from the Land of Royals, Rajasthan. Let us hear from her now..
Nithu's Kitchen : Tell us about you, Jyoti. Jyoti : I was born in the Land of Royals, Rajasthan but grew up and studied in the North Eastern State of Assam. .We are 4 siblings, 3 sisters and one brother and I am the second one. I studied Mechanical Engineering and worked for 2.5 years before getting married. I am a full time homemaker now. Nithu's Kitchen : What are your interests Jyoti? Jyoti : I had varied interests since my childhood. I loved - reading books, gardening, drawing and listening to music. But cooking was never my interest. My elder sister looked after the kitchen affairs if Mom was sick and I was happy with other household chores. By any chance if I was seen in kitchen everyone in the house would be around to pull my leg. I am a cleaniness freak and want everything in perfect order. Jyoti : It was only after marriage that I involved myself completely in cooking. My husband is a foodie and I love cooking for him. Nithu's Kitchen : What made you to start a blog? Jyoti : I started my blog just to store my tried recipes and gradually I was into this blogging world. I used to search for recipes on web and came across wonderful blogs. It inspired me to have a blog for my recipes too.. I am glad to have started this space. Nithu's Kitchen : What cuisine does you blog focus? Jyoti : Till now there are vegetarian dishes mainly from India. Hopefully, I will try my hands on more international cuisines for a variety on my blog. Nithu's Kitchen : Do you follow any cookbook? Jyoti : Yes, I do follow cookbooks. I have one given by my mom in law which is very basic. I use it as a guide. I also look into books for ideas when baking. Nithu's Kitchen : We have seen many cakes and cookies recipes in your blog. How you got this interest in baking? Jyoti : Yeah. I do love to bake. I do not eat egg. Here, it is hard to get egg-less cake. So,I started to bake my own egg-less cakes to satisfy my craving for cakes and gradually I was into it! When my bakes come out nice, I am elated like nothing else. Jyoti : Well, it's not exactly a dish. I learnt kneading dough and making chapatis. My maternal grand ma taught me. Nithu's Kitchen : Share us one unforgettable incident happened to you in your kitchen. Jyoti : There are a few incidents related to my cooking. When I first started cooking, I did not know how exactly all lentils/dal looks. I needed 'Arhar Dal' to make dal for rice and I roamed about all the Indian grocery stores but I didnot find it. I told my husband that they don't have the basic arhar dal. Next day, my husband brought me Arhar Dal and enlightened me with the knowledge that Toor Dal and Arhar Dal are same. He said, 'You should have asked the shopkeeper! ' I was ashamed of my poor kitchen knowledge! Jyoti: I just wanted to share something healthy and I zeroed on it. Hope the readers of Nithu's Kitchen like it. 1/2 Cup each of Boiled Red Kidney Beans, Cannellini Beans and Black Eyed Beans. 2 small tomatoes finely chopped. I small onion finely chopped. Fresh coriander leaves, handful, finely chopped. 1/4 cup low fat yoghurt. Black salt and freshly ground pepper to taste. Mix all the dressing ingredients and whisk well. Keep aside. Mix all the salad ingredients. Just before serving pour the dressning over the salad and toss well. Salad is ready to serve. Nithu's Kitchen : Thank you so much Jyoti. Jyoti : Thanks a ton Nithu. This is my first guest post and it is a very nice experience for me. 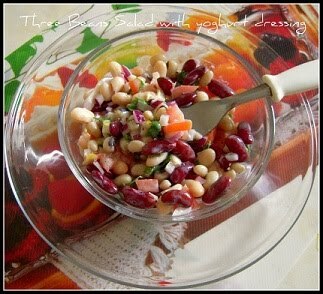 Friends, hope you all love Jyoti's healthy and colourful Three Bean Salad. If you are interested to be featured as Nithu's Kitchen's guest, please mail to nithuskitchen[at]gmail[dot]com. It was nice knowing you Jyoti :-) you have a lovely space and I love your recipes. INteresting post...glad to know more abt our friend Jyothi..! Colorful n healthy recipe...! Nice to read about you Jyoti!! Lovely blog and yummy recipes .Following your blog now!! Enjoyed the post and the healthy salad. Nice post Jyoti..loved your recipe.Gald to know more about you..
Nice to know about Jyoti !! Good one Nithu !! nice to know about jyoti....nice post.. Healthy Salad Jyothi....Happy to know about u. Wonderful post! Love to read about other bloggers. Another great guest post!! It was nice knowing about Jyoti..Loved her healthy and tasty salad.. Thanks Nithu, I have been following her blog for few months now, so nice to know so much about her. nice to know more abt jyoti..im already foolowing her blog since a couple of mths now..the salad recipe looks colourful and delish !